Brent oil could spike to $80 a barrel if the US and European Union reimpose sanctions on Iran – and as Western powers expand the scope of the Syrian civil war, JPMorgan strategists, led by John Normand, wrote in a note on Friday. “Risks we thought might materialise this summer through Iran sanctions are emerging somewhat more quickly due to events in Syria,” said the strategists, as reported by Bloomberg. New Syrian hostilities are likely to have a muted effect on oil, however, since the nation’s production has already fallen so deeply due to the seven-year-long war, it said. “A possible decision in May on Iran sanctions may be the start of a process that maintains low-intensity stress on oil markets that can deliver higher prices and above-average volatility,” the strategists wrote, comparing it to the Arab Spring of 2011 rather than the major oil shocks of 1973, 1979 and 1990. “Equity and credit markets probably won’t welcome a geopolitical/supply-driven rise to $80 that could persist for several months,” they wrote, but it won’t be “an event that drives a bear market in either.” Brent last cost $80 a barrel in November 2014, Bloomberg said. While brent is up 8% in 2018 and up more than 30% over the past year, those aren’t major moves for such a volatile market, according to JPMorgan. It also isn’t alarming when strong demand has aided the rise, Bloomberg wrote. In trade on Monday, brent crude traded at $71.79, down 1.30% from Friday’s levels; however, Bloomberg reported that hedge funds have never been so invested in the global oil rebound. 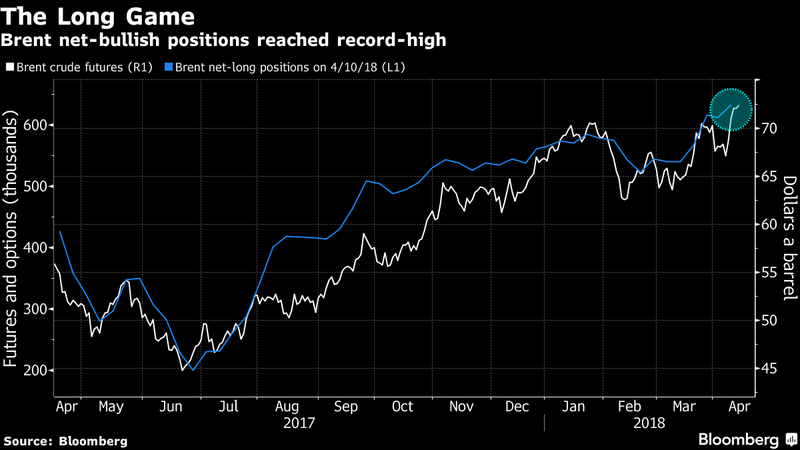 Their bets that brent crude futures will climb reached a new high as growing tensions across the Middle East are putting almost half of the world’s supply at risk, the news agency said. “Clearly, emotionally, people view markets as tighter because they are actually reacting so strongly to these tensions.” said Ashley Petersen, lead oil analyst at Stratas Advisors in New York. “There is money to be made here again” amid heightened volatility, she said. A look at supply levels on the global stage is giving the bulls something else to cheer about, Bloomberg said. The International Energy Agency said in a report Friday that OPEC is on the verge of “mission accomplished” in its work to clear the oil glut. The producer group’s compliance to its historic deal to reduce output jumped to a record 164% in March, and Saudi Arabia’s Energy Minister Khalid Al-Falih said members remained committed to maintaining market stability. Prices have risen amid “the idea that the market is rebalancing, that demand continues to be quite firm and let’s not forget the quite hefty decline in OPEC output,” said Bart Melek, head of global commodity strategy at TD Securities in Toronto. Rising oil prices would add to the burden of motorists at the pumps, following several large hikes locally in 2018 including a 72 cent hike in April, due mainly to an increase in the fuel levy and Road Accident Fund levy.